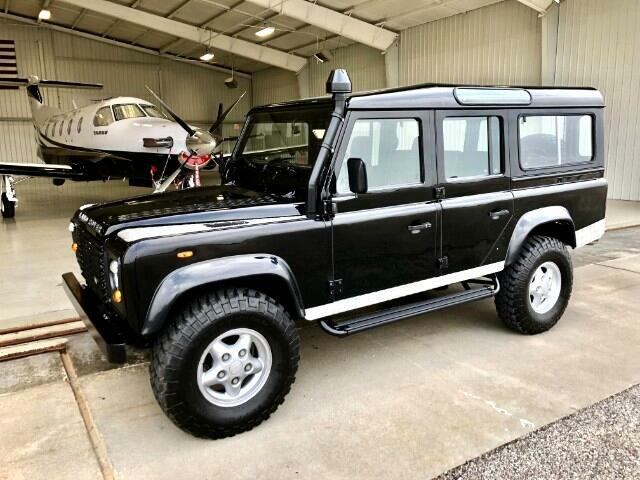 Used 1992 Land Rover Defender 110 Sold in Merriam KS 66203 Kansas City Autosport Inc. If you're looking for a very special Left Hand Drive Defender 110 (not a Spanish Santana…do the research as most LHDs in the US are) that has been built by a Master Rover Shop, fully sorted and Imported Properly into the US with a clean and clear US Title then continue on. One quick note on the pics since you’ll probably skip to them then come back to the copy if you like what you see...these were just shot and represent the rig as it sits today. I have added what I can to this listing but have 40 detailed pics in a Drobox folder linked below or if it’s been scrubbed off I can send it to you. I have just clay bar’d, polished and waxed the 110 so if you think you see a flaw I can assure you it’s just a reflection in the paint. Onto the details. One of my clients came to me in the Fall of 2016 to inquire on what it would take to import and build a proper LHD Defender 110. He was interested in something kitschy, unique and simply cool as heck to park at their home in Vail to use when they were out in the mountains. This seemed logical to me as he has vehicles commiserate with their environments at his other homes throughout the country so we started a discussion on his wants and needs for this rig. I had been down this road before with Defenders and advised him that having the 110 restored/rebuilt in Europe by a known Rover Specialist rather than us is generally a good place to start then we would tweak it from there once state-side. He had a laundry list of items which basically included all the typical upgrades to bring the rig into modern times and enhance its reliability. We had talked swapping out the engine/transmission to a GM LS/LQ setup which I discouraged for the time being at least until he gave the fantastic Rover Turbo Diesel a shot. He agreed with the plan so he decided to commission the build through Sven-Made Rovers in Sainte Eulalie en Born, France. He advised them to stick with the 200TDI (upgraded to 150hp) and forgo a/c and audio system as those items may or may not be swapped out in the near future once Ron had a chance to live with the Rover for a period of time. Fast-forward to the end of 2017…the Rover was complete and successfully imported to the US and into his hands. It took all of one trip out to their home in Vail for the “romance” of driving and living with a Defender to fade. From the very beginning I had warned him that as cool and capable as the 110s are, they are still very utilitarian and very much down to business no matter how much leather, soundproofing, modernizing, etc have been added. He continued to scoff at this since it was for their “mountain use” but it did finally sink in with him and his family. He loved the attention it brought and the rig fit in perfectly with the area but it simply did not deliver the comfort and convenience that he convinced himself that it would. They replaced the 110 with a new Range Rover and brought the 110 back to KC where he had continued to drive on occasion and place amongst his private collection. He has now come to the realization that the 110 really should be placed into service with someone looking to take advantage of its capabilities and put it to use in its natural habitat so here it is for sale. He is well aware that he had invested quite a bit more in the build of this 110 than what the market value is today. We have priced this rig at a level that should be a pretty easy decision for someone interested in a properly built and upgraded unit which is well below what it would cost you to build today. Below is a list of the highlights from Sven-Made’s build-out but please keep in mind I’m sure I’ve missed a few items. I think that pretty much covers most of the stuff but please don’t hesitate to give me a call if you have any specific questions. I may not know the answer off the top of my head but I will get it for you. So if you’re looking for a turn-key Left Hand Drive Defender 110 ready to tackle the Mountains or the Mall then look no further. This rig was built right by the right shop with the best parts available and is simply looking for a new caretaker to handle its feeding and love. It was setup with the idea of it being more than capable off-road while allowing for very comfortable highway speed cruising with its gearing. It’s really quite remarkable to drive a “new” Defender 110 that tracks straight, has tons of power and doesn’t creak and groan as it travels down the road. Message: Thought you might be interested in this 1992 Land Rover Defender 110.